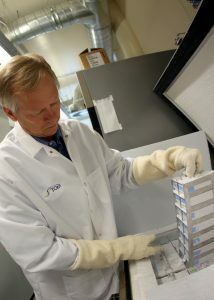 Dr. Paul Keim checking samples from a -80C freezer. 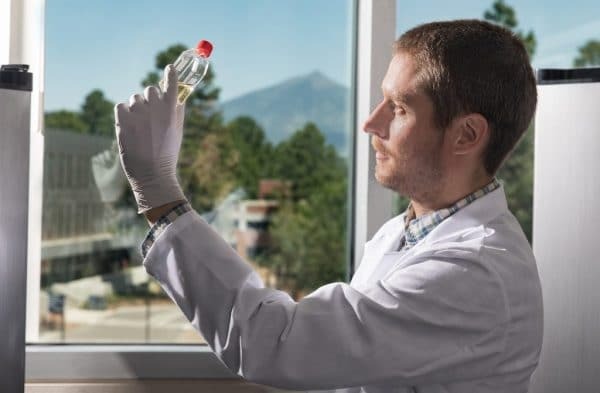 Keim, a Regents professor of biology and director of the Pathogen and Microbiome Institute at Northern Arizona University, shared his experience in forensics with fellow biology professor Frank von Hippel, an ecotoxicologist who hosts the monthly Science History Podcast. 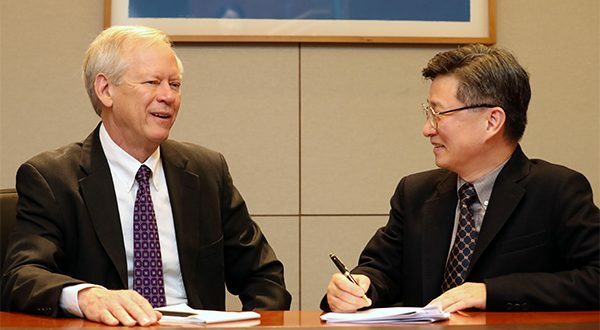 Professor of biological sciences and PMI Executive Director Paul Keim traveled to South Korea to meet with Wonjong Jang, head of the Korean Biological Safety Association and professor at Konkuk University, and to speak about the growing dangers of Botox production in South Korea. Keim was highlighted in Pulse, the country’s major business publication. Greg Caporaso of the Pathogen and Microbiome Institute was included on the Highly Cited Researchers of 2018 list released by Clarivate Analytics. The list, drawn from the top 1 percent of scientific citations over the last decade, offers a benchmark of researchers’ influence within and across 21 scientific fields. Caporaso was recognized for his publications in microbiology. Dr. Faith Walker (far right) helps students take samples of fresh feces from which DNA will be extracted. For most of us, seeing lions on an African safari would rank as the highlight of the trip, if not the year. Seeing them defecate? Not so much. But that is the first moment Northern Arizona University wildlife geneticist Faith Walker recollects when she talks about her trip to Zambia in June. Oh, and seeing a pride of lions take down a puku later that night was pretty cool, too. Two safari jeeps filled with NAU faculty and students sat quietly and watched the circle of life. It wasn’t the typical study abroad or research experience, perhaps, but it was the trip of a lifetime. PMI’s Dr. Faith Walker, along with School of Forestry professor Carol Chambers, led a group of students—four undergraduates and grad student Dan Sanchez—halfway around the world to experience what only Africa has to offer. 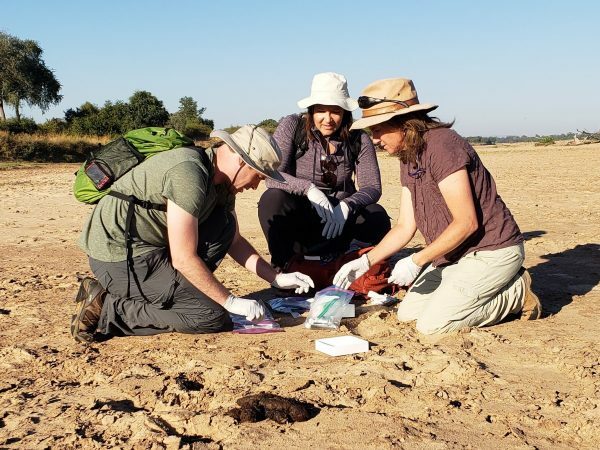 They spent a week at Zikomo Safari Lodge near Mfuwe, outside South Luangwa National Park, exploring the park, doing non-invasive research on the wildlife and learning about Africa’s conservation history and challenges. Thanks to an NAU grant, they also got to donate school supplies to local schoolchildren and help with an unusual two-pronged economic development program in the village. 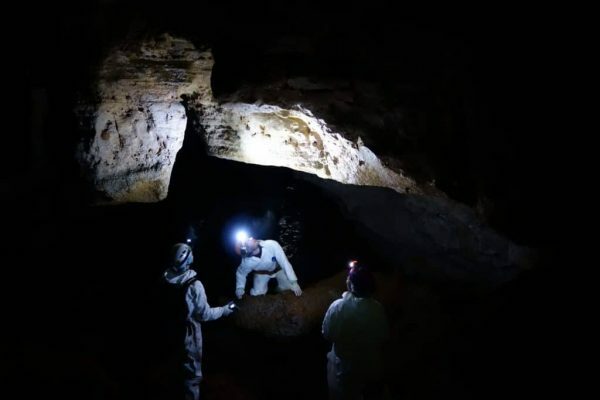 According to the Centers for Disease Control and Prevention (CDC), the 2014-2015 outbreak of Ebola virus disease in Western Africa was unprecedented, with 28,000 cases killing more than 11,000 people in Liberia, Guinea and Sierra Leone. While Ebola virus is typically spread through the bodily fluids of symptomatic individuals, the virus can persist in some compartments of the body, such as the male reproductive system. In several cases, sexual transmission from these persistent infections has resulted in the renewed spread of Ebola virus disease in Western Africa. A new study recently published in The Lancet Infectious Diseases, however, reports on the first known case of Ebola virus transmission from a female Ebola survivor. 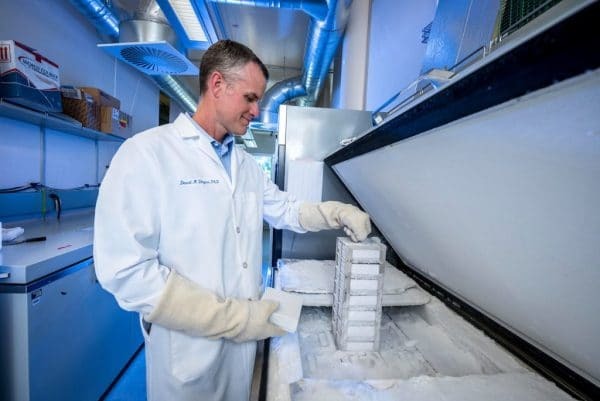 Northern Arizona University geneticist Jason Ladner, assistant director of The Pathogen and Microbiome Institute, is a joint first author of the study, along with colleagues on an international team of scientists from organizations including the CDC, the National Institutes of Health, the World Health Organization, the U.S. Army Medical Research Institute of Infectious Diseases and the International Rescue Committee. “This investigation underscores the need for focused prevention efforts among survivors, as well as sustained capacity to rapidly detect new cases, in order to prevent further spread of the virus following an outbreak,” Ladner said. PMI Undergraduate Research Assistants Shelby Hutton (pictured) and Austin Dikeman selected as Goldwater Scholars. According to the Centers for Disease Control and Prevention, more than 16 percent of adults in the United States have been diagnosed with chronic rhinosinusitis, or CRS—commonly defined as a sinus infection and inflammation that lasts more than 12 weeks. Not only do CRS patients report a significantly worse quality of life than those with asthma, congestive heart failure and chronic back pain, but the disease results in $65 billion per year in health care costs. Yet, despite the substantial socioeconomic impact of sinonasal inflammation, its underlying cause is not well understood. 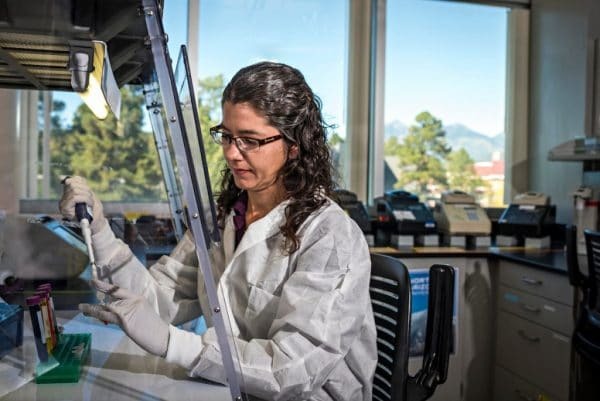 Emily Cope, an assistant professor of microbiology and assistant director of the Pathogen and Microbiome Institute at Northern Arizona University, is out to change that with her research. “The goals of my lab are to first understand the biology of the airway and the microbiome in the context of human health and disease and then to use that knowledge to develop new therapeutics, such as microbial therapies—prebiotics or probiotics—to help treat CRS and asthma,” Cope said.